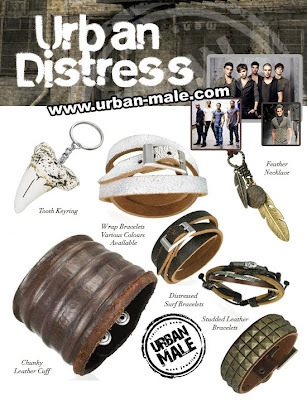 Urban Male’s new collection is Inspired by the latest fashion trend of decay & distress this range offers the ultimate accessories to go with your decayed fashion look! Featuring distressed leather cuff bracelets & necklaces which give a cool edgy look and feel to your outfit. All of our distressed range looks heavenly with some distressed fashion boots and saintly colours such as marl, charcoal, stone , green and browns. Get your boots on & man up with this decayed range of jewellery designed by men for men! We’ve already seen likes of The Wanted & JLS and wearing this look and now its your turn!